Solgaleo Null in game: 615 Who? Important notice! Pokemon Solgaleo Null is a fictional character of humans. Solgaleo (Japanese: ????? Solgaleo) is a dual-type Psychic/Steel Legendary Pokémon introduced in Generation VII. It evolves from Cosmoem when leveled up in Pokémon Sun starting at level 53. It is one of Cosmog's final forms, the other being Lunala. Solgaleo takes a special form called the Radiant Sun phase when it uses Sunsteel Strike. Along with Lunala, it was initially revealed in May 2016, but officially revealed on June 2, 2016. Solgaleo is the game mascot of Pokémon Sun, appearing on the boxart. Solgaleo is a large, white Pokémon resembling a white lion. It has a blunt muzzle with a blue-gray nose and pale blue eyes. The top half of its face is a deep blue area that shows a constantly changing starscape. Four yellow spikes frame Solgaleo's head like a crown and two more pairs of spikes adorn either side of its lower jaw, and each spike separates large tufts of Solgaleo's mane. Solid ridges—red nearest Solgaleo's head and yellow farther away—poke out of each tuft along the middle, except on the tufts on its cheeks and chin, with the topmost part wrapping around the tip of the tuft. Overall, its mane composes the impression of a stylized sun. Around each leg is a dark orange band, and there is a black spot on each foot. It has three black toes on each foot with long yellow claws. At the tip of its tail is a large black spot with a thin yellow rim. When Solgaleo enters its Radiant Sun phase, a light blue symbol appears on its forehead and the starscape turns to streaks of light. The fur on its body glows a pale yellow and all other parts of its body except its nose turn bright yellow. Known as the "beast that devours the sun," Solgaleo has long been honored as an emissary of the sun. Its body is capable of holding a vast amount of energy and glows when active. Solgaleo can compose Ultra Wormholes to travel to and from Ultra Space. Solgaleo along with its counterpart Lunala can compose Cosmog. Solgaleo is the only known Pokémon capable of learning the move Sunsteel Strike. Moves marked with a superscript game abbreviation can only be bred onto Solgaleo in that game. Solgaleo and its evolutionary relatives are the only Legendary Pokémon that are part of an evolutionary family. Solgaleo has the highest base HP of all Steel-type Pokémon. Solgaleo and its counterpart Lunala are the only Legendary version mascots of a generation's primary pair of games with a base stat under 90. In Solgaleo's case, this is its Special Defense. 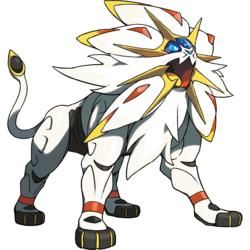 Solgaleo is based on a lion with a sun motif, a fairly common motif in many Western and Middle-Eastern cultures. 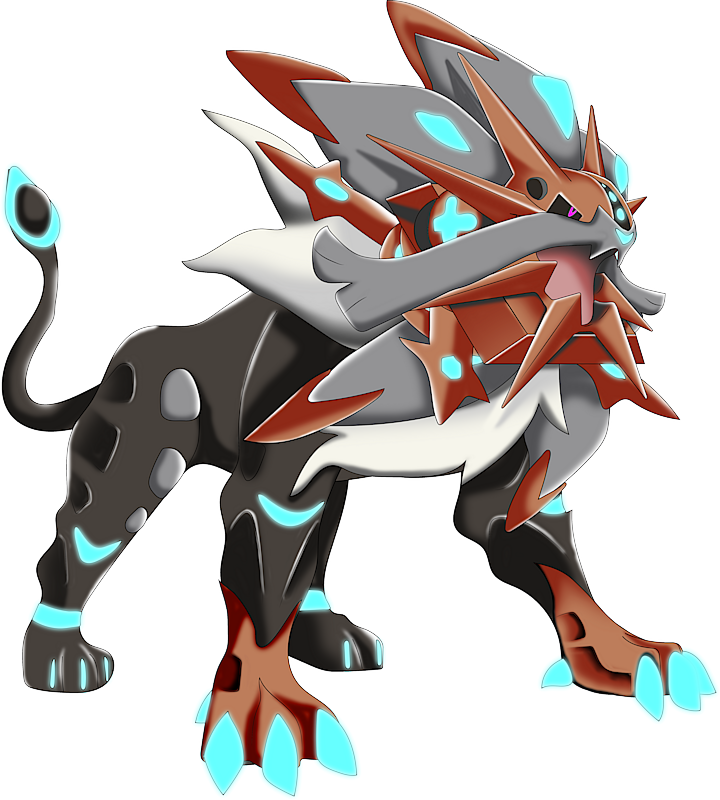 In particular Solgaleo might reference the alchemical lion, being described as "devouring the sun", as well as connected to metals via its Steel-type. Finally, being the emissary rather than personification of the sun as well as being able to pass through different dimensions. Solgaleo may be a combination of sol (Latin for sun) and leo (Latin for lion). It may also incorporate Galileo, an Italian astronomer who presented evidence that the Earth rotated around the Sun and advocated Copernican heliocentrism. Japanese ????? Solgaleo From sol and leo.